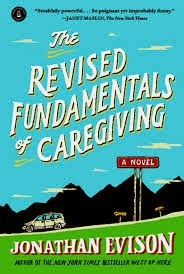 a book chick: "The Revised Fundamentals of Caregiving"
"The Revised Fundamentals of Caregiving"
my take: There's hardly a more pathetic main character than Benjamin Benjamin and a complete cast of wacky supporting actors ... very much like an Anne Tyler novel. Ben's woeful situation becomes clearer as it's slowly revealed .... It's painfully sad and yet madcap - I laughed out loud several times. The road trip is priceless - hilarity and calamity seem equally possible around every bend in the road. The chapters are short and at night I kept thinking "just another one" until it was quite late. This one had me thinking after I finished it ... couldn't quite shake it and start another book. my verdict: Great read ... touching, funny, depressing subject matter. Madcap and Anne Tyler-ish... sounds good to me! I really, really, really liked this book, maybe in part because I picked it up at Kramerbooks on Dupont Circle, and that's one of my happy places. But I was quite taken by Benjamin and his heartache as well. Thanks for recommending!